Tannie Evita has to blow out 80 candles on her koeksister-koek! Celebrate Tannie Evita’s 80th birthday on Sunday 27th September by watching her special tribute on KYKNET DStv channel 144 at 20h00. 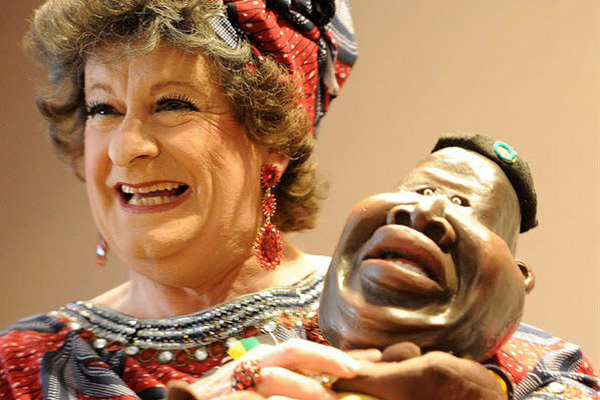 And make a date with her at Montecasino Theatre JHB util Sunday 04 October and at Theatre on the Bay CPT from 3 November, as she joins EFF Number 1 Teletubbies Julius Malema, former apartheid leader PW Botha, eternal kugel Nowell Fine, our beloved Nelson Mandela, Zimbabwe’s First Lady Grace Mugabe, former foreign minister Pik Botha, a giggling man called Jacob Zuma, Mother of the Nation Winnie Mandela and Cape Flats poo-dodger Mrs Petersen on stage. Also get the YOU or HUISGENOOT magazine coming out on 24th September for a profile on Pieter-Dirk Uys, who also celebrates a birthday with Tannie Evita on 28th September. He will always be ten years younger than her!